Located within the fully-licensed area of City Walk called The Square, Galvin Bistrot & Bar was brought to Dubai by famed British brothers, chefs Chris and Jeff Galvin. 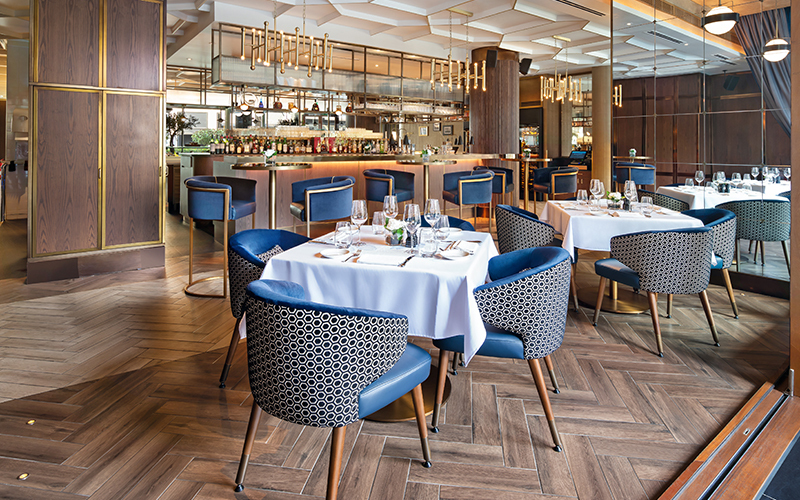 Previously known as just Galvin Dubai, the elegant multi-level restaurant, bar and lounge recently underwent a re-brand and menu change to offer a more casual and accessible approach. 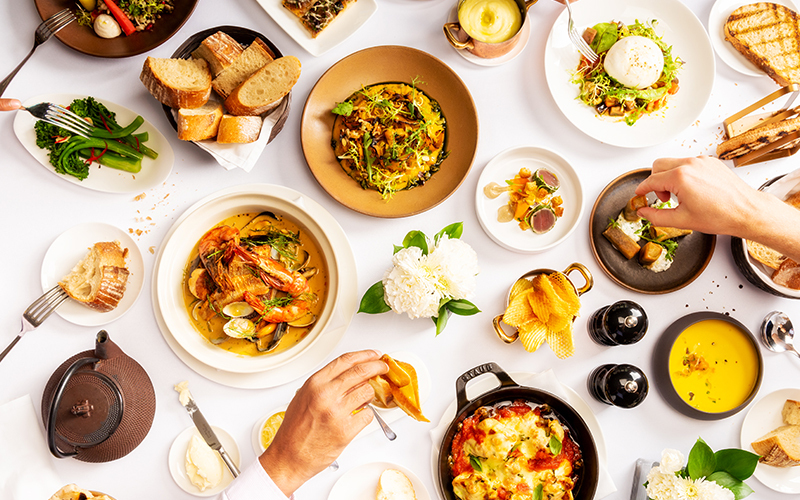 Now serving French bistrot cuisine with an emphasis on simplicity and seasonality in a relaxed environment, Galvin offers ample indoor and outdoor seating. The sophisticated outlet boasts a fantastic social climate that is stylish and inviting. With warm, welcoming interiors and hospitality, it’s easy to feel right at home upon arrival at Galvin Bistrot. The interiors inside remind me of a high-end traditional British restaurant that marries styles old and new – think dark wood, royal blue and copper tones, with contemporary touches and views into the kitchen over the pass. Led by BBC Good Food Middle East’s ‘Chef of the Year 2018’ winner, executive chef Luigi Vespero, who worked alongside the Galvin’s in London, the kitchen here operates with skill and attention to beautiful flavours. Expect to experience fantastic classic cooking inspired by traditional, all-time favourite French dishes. To start the experience at Galvin Bistrot, the lasagne of Devon crab served with rich, creamy bisque and lobster oil is not to be missed. 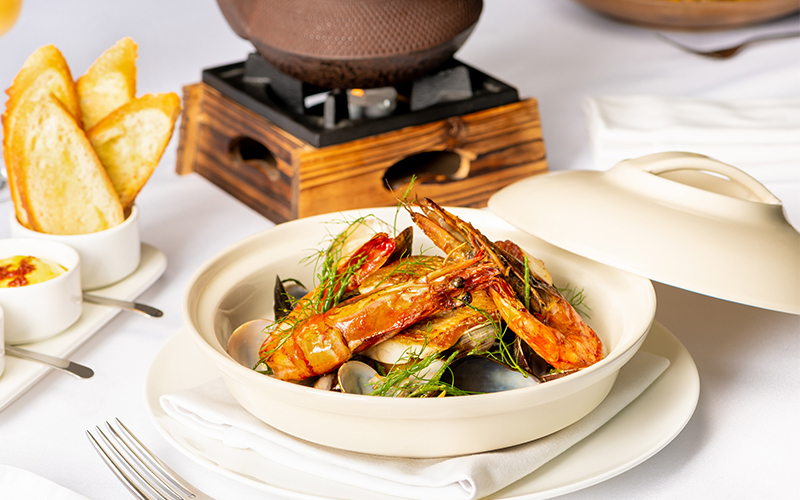 The delicate dish is a delight to eat and is sure to impress if you’re a fan of rich seafood flavours. Next, try the heritage beetroot salad with truffle goat’s curd, candied walnuts and chard – the beetroot is beautifully prepared and paired with an airy goat’s cheese that’s not over-bearing and compliments the dish superbly. My favourite dish of the evening was the main course of the restaurants new signature dish – the Galvin bouillabaisse (seafood stew), served with aromatic grated gruyére, rouille and toasted sour dough slices for dipping. Made up of prawns, mussels, clams and fish, the stew was packed with such beautiful flavours from the sea, while the seafood was cooked to perfection. My dining partner enjoyed an equally flavour-bursting dish of beef bourguignon – slow braised ribs that melted in the mouth and boasted strong meaty tastes, with creamy potato puree and Hermitage jus to drizzle on top. For dessert, if you’re a chocolate lover don’t miss the Valrhona chocolate assiette, which includes a small chocolate fondant, a white mousse and a mini tart, all made with different Valrhona chocolate that vary in strength of flavour and marry together to offer a blissful ending to the meal. The team at Galvin Bistrot & Bar is inviting and friendly, ensuring that your dining experience is warm and welcoming. Galvin Bistrot & Bar uses great ingredients that are handled with respect, and offered with fantastic value for money. A great place to share an evening with your loved one or a small group of friends over dinner downstairs, followed by drinks at the upstairs bar and jazz lounge, The Green Room. The restaurant is also a great spot to check out on Saturdays, when it runs the ‘Great British Roast’ offer. The laid-back, hearty and traditional meal is served between 1pm and 6pm, and costs Dhs135 per person. Details: Priced at around AED 300 for three-courses, without beverages. For more information or to make a reservation, call+971800425846, e-mail reservations@galvindubai.com, or see galvindubai.com.